Magnesium is found mostly in our bones like most of the other minerals. Magnesium cannot be synthesized in our body and must therefore be plentiful in our diet in order for us to remain healthy. Low levels of certain minerals like magnesium, potassium, calcium and sodium have long been linked to leg cramps. Most cases of muscle cramps are caused by low concentrations of magnesium in the blood. • Helps in metabolism of proteins and fats. • Helps blood to circulate smoothly. • Helps in strengthening the bones. • Muscle cramps, or weakness. 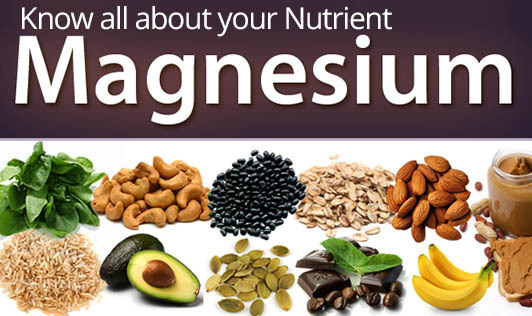 Foods which provide you Magnesium: Green vegetables are good sources of magnesium. Some legumes like peas and beans, pumpkin seeds, nuts and whole, unrefined grains are also good sources of magnesium. Refined grains are generally low in magnesium because magnesium-rich germ and bran have been removed during processing. So next time you have a muscle cramp you know what you are running short of. In fact you first ran out of magnesium before any other electrolyte in your body.